Need a Geotechnical Engineer for residential work? 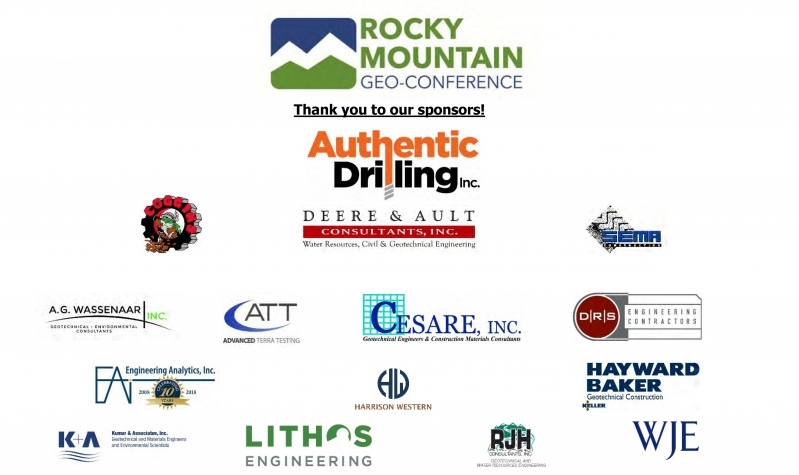 The Geo-Institute Chapter of the Colorado Section of the American Society of Civil Engineers (ASCE), the Rocky Mountain Section of the Association of Environmental & Engineering Geologists (AEG), and the Colorado Association of Geotechnical Engineers (CAGE) have hosted the Rocky Mountain Geo-Conference since 1984. This conference focuses on geotechnical projects in Colorado and the Rocky Mountain Region, and is a one day opportunity for geo-professionals to share experiences and state of the practice with their colleagues. Papers will be published by ASCE as a Geotechnical Practice Publication (GPP) and distributed at the conference. For questions related to conference registration, exhibits, and/or sponsors, please contact Becky Roland (staff@coloradoasce.org).If you have questions with regards to the conference please contact conference chair, Christoph Goss, (christoph.goss@deereault.com). Registration forms are due by October 26, 2018.